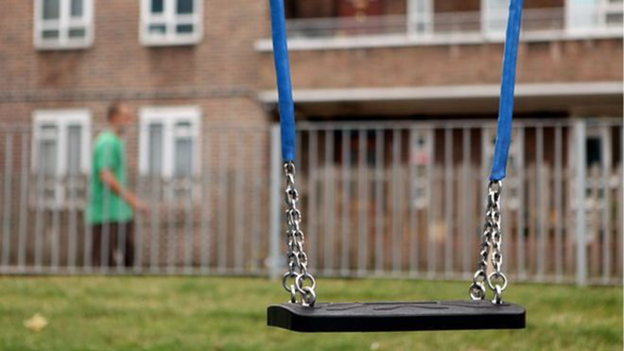 The number of children living in relative poverty in the UK remains 2.3 million, government figures show. The Department for Work and Pensions said the proportion of children living in poverty - almost one in six - was also unchanged from 2011-12 to 2013-14. Charities say levels have gone up in the last five years and welfare changes will leave families worse off. But Work and Pensions Secretary Iain Duncan Smith said UK poverty levels were the "lowest since the mid-1980s". The DWP said the percentage of children in relative low income households remained at 17%. A child is defined as being in poverty when living in a household with an income below 60% of the UK's average. Mr Duncan Smith added that government reforms of the welfare system were focused on "making work pay" and getting people into employment. He told the Commons he remained "committed" to dealing with the "root causes" of poverty. But shadow chancellor Chris Leslie said the latest figures represented a "depressing slow-down in the progress we should be making as a country". Javed Khan, chief executive of children's charity Barnardo's, said every child living in poverty was a child that was being "let down". He said: "Government plans to cut struggling families' incomes further by changing tax credits is deeply concerning. "So that every child gets the chances in life every child deserves, this government must ensure that change to the benefits system makes work pay for those on low incomes, and doesn't force families further into poverty." 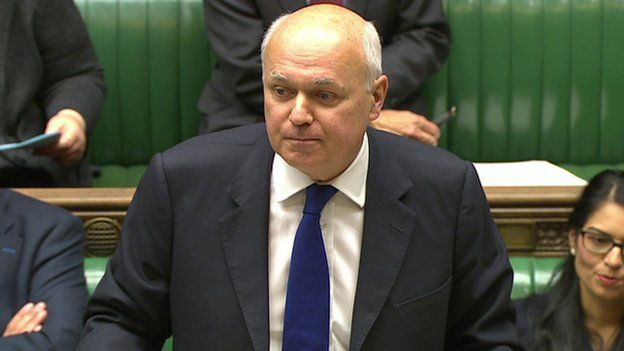 Iain Duncan Smith said the government was "creating a welfare system that makes work pay"
Matthew Reed, chief executive of the Children's Society, said it was "a scandal that there are 200,000 more children who have been pushed deeper into poverty over the past year". There has been a "steady rise" over the last five years in the numbers of children living in poverty in households where parents work, he added. Meanwhile, Alison Garnham, chief executive of the Child Poverty Action Group, said the figures make "grim reading", adding: "Make no mistake, we are facing a child poverty crisis in the years ahead and the government is not going to meet the child poverty targets." It comes as the government has said it wants to change the way child poverty is measured - as it believes the current measure is inadequate. The latest figures also showed that 9.6 million individuals were on relative low incomes in 2013-14. The average real terms household income - before housing costs - remained unchanged from 2012/13, at £453 a week.